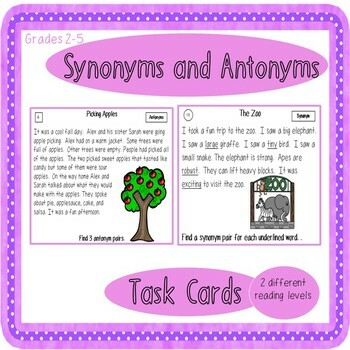 These 20 task cards provide students with practice matching and identifying synonyms and antonyms in context. There are 20 cards written at two different in both color and black and white. The content is appropriate for students in upper grades reading below grade level. The task cards are designed to be simple to cut out, with no borders.